Cave diving has been called the “most dangerous participatory sport” in the world. It doesn’t have to be. With proper training, experience, and guidance, you can be a skilled cave diver, and enjoy this challenging and rewarding activity, for a lifetime. With decades of technical diving experience, including world record cave dives, and paradigm changing underwater exploration, Woman Divers Hall of Fame member Jill Heinerth, has created this full color contemporary guidebook. 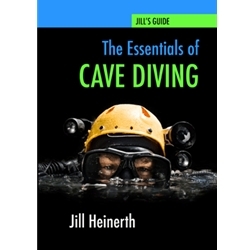 Generously illustrated, “The Essentials of Cave Diving” contains practical 21st century underwater knowledge, including sidemount techniques and the latest rebreather technology. Encompassing all levels of cave diving, from apprentice to expert, from sidemount to CCR, this guide is an essential manual; appropriate and relevant to all cave training disciplines.